Valves are used to stop and regulate the flow of water, and each type of valve has its pros and cons and its best applications. Most valves in a household plumbing system are part of the water supply system and control the flow of pressurized water from the water utility or a private well. The design of a valve may determine how much water flow it allows or whether it should be used for adjusting flow rather than simply turning the water on or off. Gate valves are among the most used valves in plumbing applications. Gate valves control water flow by raising or lowering an internal gate via a knob at the top of the valve. Gate valves should never be used to reduce the flow of water; in other words, they're designed to be all the way on all the way off. Using them to adjust water flow can wear them out. They are very reliable and are commonly used as shutoff valves on main and branch water supply lines. Ball valves are perhaps the most reliable type of valve and are commonly used for main water shutoffs and shutoffs branch supply lines. Ball valves have a ball with a hole in the middle. The ball turns to stop water or let it flow through the valve unimpeded. 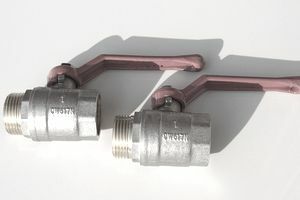 Ball valves are operated with a lever-type handle. When the handle is parallel to pipe, the valve is open. When it is perpendicular, the valve is closed. So the handle serves as a handy visual aid so you know at a glance whether the water is on or off. Ball valves are designed to be on or off; they shouldn't be on just a little bit. Globe valves are used to regulate flow in plumbing applications. Globe valves are usually installed when the flow of water needs to be regulated or when it needs to be adjusted regularly. They contain a stopper that is raised and lowered by the valve knob. The stopper seals into a baffle to stop the flow of water. Globe valves get their name from the globe-like or ball-like appearance that the body of the valve has. Because globe valves are good for regulating flow, they are often used for outdoor faucets (hose bibs) and similar utility faucets. Check valves typically are used in water tanks and other water storage applications. This type of valve has an inlet, where water comes in, and an outlet, where the water goes out and allows the water to travel in only one direction. On a water tank, a check valve allows pumped or pressurized water to come into the tank, and when the pump or pressure is turned off, the valve prevents gravity from drawing the water back out. A similar type of device used on outdoor faucets is called a back-flow preventer. Water pressure-reducing valves are installed to reduce the water pressure to the desired or accepted limits. They normally have a spring and diaphragm that is adjusted to a specific limit, depending on the pressure of the water supply. Pressure-reducing valves are not used to turn the water flow on or off. The area commonly used in homes that receive relatively high-pressure water from the city. Overly high water pressure is hard on house plumbing systems and appliances. Butterfly valves have an internal disc that rotates to regulate the flow of water. Because the water flows around the disc, which is at the center of the valve, the water flow is reduced somewhat, even when the valve is fully open. The rate of water flow can be precisely adjusted with a butterfly. One notable drawback of a butterfly valve is that the gasket inside the valve can present maintenance issue after a couple of years. Butterfly valves are used primarily in industrial applications and are not commonly found in household plumbing systems. Fixture shutoff valves are small valves with turning handles or knobs and are used to control water flow to individual plumbing fixtures, like faucets and toilets. There are straight versions and 90-degree-angle versions (also known as angle valves or angle stops). Shutoff valves allow you to work on a faucet or other fixture without having to shut off the water to the whole house at the main shutoff valve.